So there’s this guy. Wears a green shirt. Each and every day, he drops by his friend’s house; this friend wears nothing but blue shirts every day. Anyways, whenever green shirt guy visits blue shirts guy’s house, blue shirts guy’s dog starts barking. Just won’t stop, very loud, terribly upset, and all this. For the longest time, neither guy can figure out why the dog’s barking. Eventually, blue shirts guy suggests that maybe green shirt guy wears a blue shirt instead, and at first, green shirt guy is unsure, but after some cajoling, he takes blue shirts guy’s advice, and comes back the next day with a blue shirt on. The dog doesn’t bark, seems perfectly happy to see the guy, who figures the problem’s been solved, and comes back the next day. So with that in mind, let’s talk about Bioshock. Brief rundown: super memorable game. We’re in a plane. We crash. Biff! Wham! Pow! We find a mysterious light house on a tiny island, which we enter. It takes us down, down, down, under the sea, where a massive city lies dying, embroiled in a civil war over the super-power-granting juices of some creatures that were discovered on the ocean floor. The city was founded on an extremified, almost cartoonish form of objectivism, but that belief system’s fallen apart, because, well, people tend to be selfish. Our guide through the city, Atlas, eventually reveals himself to be Fontaine, the game’s big bad, and furthermore, reveals that you’re a mind-controlled slave, the words “would you kindly” basically making you do anything. The point of the sequence is basically that hey, games are controlled experiences, and regardless of what illusions you may have about your relationship to the game, it’s all a very controlled experience. Then the game features a really linear last hour, everyone hates it, and the experience is over. Bioshock 2 showed up, but most people ignored it, because they “didn’t want to go back to Rapture,” and felt that Bioshock had played the city out. It was a disappointing response, because Bioshock 2 was an amazing game with a great story about familial relationships, as well as player choice and consequence. Plus it had better overall gameplay. If you had never played a Bioshock game before, I’d probably just tell you to play Bioshock 2 and the DLC, Minerva’s Den, which was made by some of the guys who ended up creating the apparently awesome Gone Home. A bunch of people got really, really excited about this, particularly the people who felt Rapture didn’t need to be returned to. Some of us got excited by the whole ‘amazing sky roller coasters’ thing, or the whole ‘city in the sky’ concept, or the… well, there was a lot to get excited about. It looked super cool. 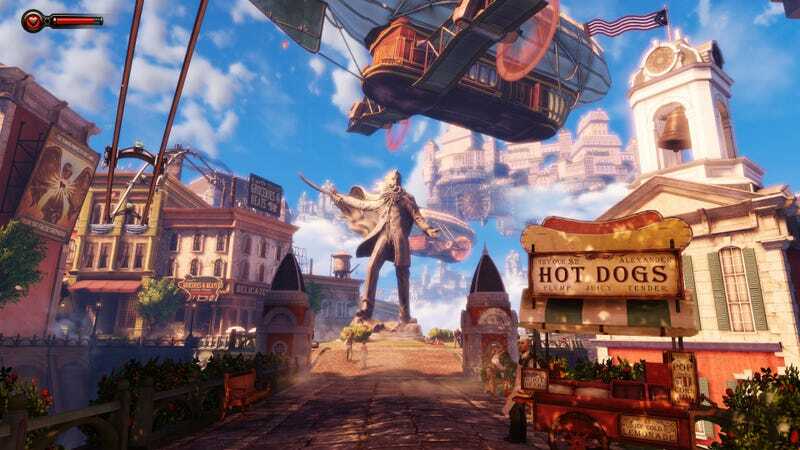 The game released to mass critical acclaim, which, within two months, turned to a sort of tepid “well, Bioshock Infinite could have been better if…” response with a laundry list of possible reasons why it could have been a better game. So. Let’s explore what happened before “Would You Kindly?” How did you react to the game? How did you treat the world? Did you enjoy Arcadia as much as I did? Did you enjoy pretending to be a person exploring the ruins of such a fascinating and unique world, hunted at every turn by twisted, bizarre human beings, hunting Big Daddies in turn? How did you feel after that, when the game became a much more linear experience, when you had to walk through the museum, guiding a little sister, pausing while she drained bodies of their ADAM, eventually leading you to the boss fight at the end of the game? Assuming you enjoyed the gunplay—many people have complained about Bioshock’s overall gameplay, citing it as fairly boring—you probably had a great deal of fun with the game. Arcadia was probably your favorite level, though you might be partial to Fort Frolic instead. Once you got to the linear bits, right after beating Andrew Ryan to death, you probably started to fall out of love with the game. Truth be told, you might not really remember what happened all that well; you definitely don’t care, though. The bit that left the biggest lasting impression on you, of course, was the “Would You Kindly?” reveal? Am I close? Judging by most of the reactions to the game that I’ve read over the past seven years, I should be fairly close to the average take on the game. Thing is, “Would You Kindly,” despite being the most talked-about part of the game, is actually its worst part. What is that moment actually saying? It would appear that Bioshock is claiming that games, all games, are fake experiences, that they didn’t actually happen, that player choice is an illusion, that interactivity doesn’t really matter. For many people, this came as a revelation. For some, it was a validation that the video gaming holy grail, the holodeck, wasn’t worth pursuing after all. For a lot of people, it was really smart for having something to say about the nature of video games. Only… it’s not a very good point, not really. Telling you that the artistic experience you’re involved in is somehow not real is just so silly, so completely missing the point of the experience. Yes. I know that works of fiction are, in fact, fictional. Big deal. The way I connect to these pieces is very, very much a real thing. I can connect to them as real. If you, the developer, want to do the work of creating a real experience, then I can get even more involved and feel even more things and… yeah, I can learn something from it. If you can pull that off, you’ve gone from engineering a product to making a work of art. Get me connected on an emotional level—don’t tell me that this work of fiction I’ve willingly participated in is fake. I know it’s fake. I’m pretending it isn’t, because, well, I’ll get something real out of it, and that’s important. And I think this is one of the reasons why people responded to Bioshock 2 the way they did. Truth be told, if people don’t enjoy a game, they’re less likely to pick up its successor, even if they tell you they liked it. Part of the reason Bioshock 2 didn’t do so well was because those last moments in Bioshock were all about how the whole experience was fake. Didn’t matter. Was all a lie. And really, who wants to go back and explore a world that they’re continuously reminded is fake? It would be like trying to enjoy your favorite television series while some overly-literal INFJ type keeps talking about how fakey fake fake the whole experience is. Yeah, we know it’s fake, so shut up already. Of course, Bioshock 2 was developed by a different team. In a way, it works as an argument against the first Bioshock. Where the first game provided a cartoonified version of Randian objectivism (born, it must be pointed out, as a result of Rand’s experience with collectivism, which was horrible), Bioshock 2 points out that collectivism isn’t a better answer and suggests that it might not be good to take an extreme position either way. Where Bioshock proffered the idea that a game could be fake, that players were, in a way, slaves, Bioshock 2 suggested that even slaves have choices, and a game experience could still be real if players and developers were willing to meet together. Then Minerva’s Den just flipped everything on its head and was awesome and explored issues like race and stuff. Everyone should play it. Then comes Bioshock Infinite, and instead of learning from Bioshock 2, or even dealing with it, the folks at Irrational seemed to just completely ignore 2K Marin’s work, instead choosing to take “Would You Kindly” to its logical extreme. We may praise “Would You Kindly” as the reason Bioshock is a great game, but it seems to me that the reason any of us reacted to Bioshock the way we did was because we liked everything that came before “Would You Kindly.” The stuff that came after… we’re not so hot on, y’know? And Bioshock Infinite’s just taking that stuff and going even further with it. The game dispenses with any notion of choice or consequence—heck, the game’s ending is some trite, cliché multiple worlds thing that suggests that no choice you make matters, because all stories are all the same, or some similar nonsense. Bioshock tried to prove to us that games could be nothing more than hollow shells, fake experiences created by game designers because, uh… I dunno. Because paychecks. Because they feel like it. Whatever. Point is, these games aren’t real experiences. What you choose and how you choose to go about it doesn’t matter. Bioshock Infinite is an acceptance of that idea as gospel, and as a result, a lot of people are frustrated by it. They love the way the world looks, but shrug at the stuff they have to do in it. They don’t really care about the gameplay, saying they’d rather not spend all their time shooting things, they laugh at how Elizabeth is such a fake character, and then… they say it’s good, but they rarely seem able to explain why. “It’s a masterpiece,” they say, some suggesting that it’s the best game released this year, but nobody’s written lengthy exposes on the brilliance of the Lighthouse ending (because it’s not? ), nobody’s acted as if the Booker/Elizabeth relationship is anything special (because it definitely isn’t)… there’s just nothing about Bioshock Infinite that comes across as it being a really good game with any really meaningful stuff to say. In the end, Bioshock Infinite is a game with great audiovisual presentation, great dialog, and a college freshman’s understanding of various sociopolitical ideas. When it was being advertised, Bioshock was touted the spiritual successor to a game called System Shock 2. Many people were disappointed with the end result—Bioshock isn’t nearly as good as its predecessor. 1999 mode claimed to change that. Thing is, System Shock 2’s what’s called an ‘immersive sim,’ part of a genre of games developed by Looking Glass Studios back in the 90s and early 00s. It was a totally different way of thinking about how video games were made, with a tremendous focus on creating these sort of sandbox environments that players could inhabit and treat like a real space. Irrational got its start in the same office space as Looking Glass Studios, its employees former LGS employees who had worked on Thief, an earlier immersive sim. System Shock 2 was their first big game, and it is still one of the best video games ever, despite its age. System Shock 2 is all about creating a real space. It’s not, as 1999 mode would suggest, a game where enemies soak up even more damage than normal and the player has far less health than they should. Instead, it’s about creating a series of continuous levels that players can travel between as they so choose. It’s about managing resources, about emotionally connecting with the experience, about existing within a simulated reality, rather than a planned one. Instead of engaging the player when he or she walks into a combat arena, the enemies roam entire decks of the two space ships within the game, and combat happens when the player stumbles upon and chooses to engage the enemy, or when the enemies discover the player. Difficulty comes from being alone and from not having enough resources to take on the enemies in a fight. System Shock 2, ever since I first played it in 2008, after hearing that it was "more Bioshock," has become my favorite video game. I personally think it's the greatest, most important video game ever made. It's influenced everything from the Portal to Bioshock to Dead Space to plenty of other games over the past few years. It won't leave my head, where Bioshock Infinite, in contrast, is all but forgotten for me, just like that final hour of Bioshock. And you may think "hey, this isn't important; games can be superultralinear unreal experiences and be amazing," and in some ways, you might be right. But, I don't really think people work that way, which is why we covered how people not conditioned to video games respond to them very differently to people who've played them for years. When I look at the people who aren't used to playing games, I see people who treat these worlds as if they're real places. They wonder why you can or can't do this or that. The games that appeal most to them are things like Grand Theft Auto and Minecraft, games which let them inhabit these realities. But then you see people who are super deep into studying games and games design, who are focused on the 'games' part of the experience, and think purely in terms of these binary rules and stuff, and they're all "well, the holodeck idea is a myth. We can never attain that. We shouldn't, because that's not what games are..." but I dunno. I'm of the opinion that we can build really amazing, transformative experiences based on the promise that games have for people who aren't all too familiar with how they work. I think we should revisit the immersive sim and build on it. Bioshock Infinite isn’t an immersive sim. 1999 mode references System Shock 2, allegedly to quell the complaints of the people who claimed that Bioshock hadn’t been nearly as good, but it’s further away from System Shock 2 than ever before. It doesn’t help that the game seems entirely designed with consoles in mind—instead of using the 451 code, the genre’s signature number, to unlock 1999 mode, players enter the Konami code. The game references other games, all console experiences. The 451 shows up once in a game, on a door that’s entirely different from all the others—it feels forced in. Bioshock Infinite feels like it betrays the ideals its genre was built upon. All the promise of the immersive sim, which has begun to regain popularity with the resurgence of games like Deus Ex: Human Revolution and Dishonored, has been sucked out of Bioshock Infinite’s experience, because the folks at Irrational have decided that it’s all fake, that it’s not worth making a real experience. Bioshock Infinite looks nice, sounds nice, and sometimes feels pretty nice. The gameplay’s middling, with boring boss fights and hordes of bullet spongey enemies who don’t really behave in terribly interesting ways. The world feels hollow and unresponsive, as believable and worth spending time in as Battlefield 3’s. It’s not really an experience worth having, because it doesn’t really try to be. What we wanted was another Bioshock, another real world to inhabit and explore. We didn’t want Bioshock’s final hour or boss fight… but for some reason, that’s exactly what Irrational gave us. We may look at Bioshock and think "hey, Bioshock is awesome because it said something about video games," because that's our tangible response, but I think, if you look at the series as a whole, look at the design decisions that drive it, you'll find that we respond the way we do not because it asked us to kindly consider games as fake experiences, but because, at least for a while, it gave us a real one. I post this stuff on Tumblr, and I can be found on Twitter. Hopefully you enjoy it; I love writing it and reading/responding to your comments. I’m just kinda chillin here at work, looking around for better employment, in the hopes that I can maybe worry less about paying the rent and buying groceries, and waiting for your replies. Have an awesome, totally-not-rainy day! *For more on the nature of tangibles affecting the way we perceive a thing, read Film Crit Hulk’s article here. Yeah, he writes in all caps. You can either get over it and benefit from the way capital letters slow you down and make you contemplate what he has to say, or you use ConvertCase to read it normally. **By the way, a big part of enhancing your first-person experience is for your display to take up a large part of your field of view, so you should be playing this on a PC. I’ve noticed more enjoyment from people who played it on the PC than those who played it on consoles.